"My friends, love is better than anger. Hope is better than fear. Optimism is better than despair. So let us be loving, hopeful and optimistic. And we'll change the world. With those words, he bids us farewell. Jack Layton is no more. 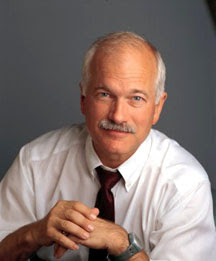 Jack Layton has gone to his heavenly abode. Jack Layton has passed on. Jack Layton is dead. Jack is dead. I am stunned, at a loss for words. The Sikh Kaum has lost our staunchest ally and friend in Canada. The loss there is incalculable. 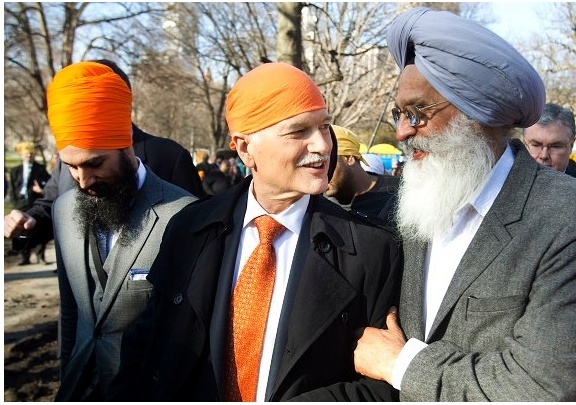 But Jack Layton was more than a friend and ally; he was proof that it is possible to be a moral, upright, strong, uncorrupted human being - and a politician. Like myself he was a native of Montreal and a graduate of McGill University. Like myself, he was a social democratic. I really am at a loss what to say about him. He took the New Democratic Party (NDP) from a sort of fading bunch of would-be do-gooders in 2003 to becoming Canada's official Opposition Party in 2011. He died of prostate cancer. Mani was an oncologist, a cancer doctor. Perhaps he could have cured him. Again, those saddest words, "What might have been." I think the best way to describe Jack Layton is to let him speak for himself. When he realised he might be dying, he wrote this final statement to us. And finally, to all Canadians: Canada is a great country, one of the hopes of the world. We can be a better one – a country of greater equality, justice, and opportunity. We can build a prosperous economy and a society that shares its benefits more fairly. We can look after our seniors. We can offer better futures for our children. We can do our part to save the world's environment. We can restore our good name in the world. We can do all of these things because we finally have a party system at the national level where there are real choices; where your vote matters; where working for change can actually bring about change. In the months and years to come, New Democrats will put a compelling new alternative to you. My colleagues in our party are an impressive, committed team. Give them a careful hearing; consider the alternatives; and consider that we can be a better, fairer, more equal country by working together. Don't let them tell you it can't be done. I am watching CBC news as I write this. I smile as I hear the announcers and the people talk about "Jack." Not "Jack Layton." Not "Mr. Layton." Jack. Our Jack. He belonged to all of us, the people of Canada, people of hope and love and goodwill everywhere. Even those who opposed his politics liked him. That bright infectious smile was no act. Writing now is difficult for me now; I suppose you can feel this. I asked a friend when I first received the news, "Can I cry?" The response was, " You are a kharkoo. You are not allowed to cry." All I could say was, "Too late." I must correct myself. Earlier I wrote, "Jack Layton is no more." We write that, but in this case it is not true. 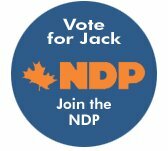 As long as we hold true to his hopes, his dreams, his optimism, Jack Layton is still with us. I ask each of my readers to please take a moment to say a prayer for his family, for Canada, and for the world; our world has been diminished by his death. I just heard him described as "relentlessly optimistic." I wonder if he knew the phrase "chardi kala." Whether or not, he certainly lived that way. Good-bye, Jack. I love you. Mes amis, l'amour est cent fois meilleur que la haine. L'espoir est meilleur que la peur. L'optimisme est meilleur que le désespoir. Alors aimons, gardons espoir et restons optimistes. Et nous changerons le monde. there is always a sense of loss when a good friend departs this life. Bhenji, yes. It's hard when a loved one dies. At least I know Jack went peacefully to wherever he is now.